Increase seating space for viewing that intense game of billiards with this comfortable Harley-Davidson Spectator Bench. 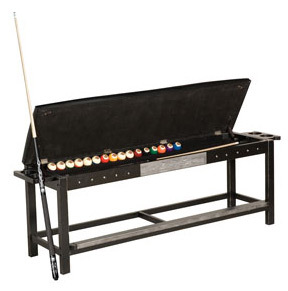 Embossed Bar & Shield flame leatherette seat lifts up to store billiard balls and cues. 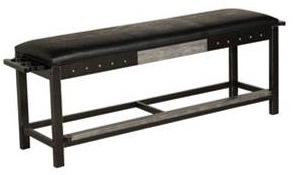 Bench is embellished with studs and a custom etched Bar & Shield flame metal plate and equipped with cup holders and cue rests on both sides. This distressed Vintage Black hand rubbed finish features antique pewter accents. Easy assembly required. Billiard accessories sold separately.